The Ideas club is a student-led startup accelerator, says Jasmine Sanchez. Inside The Idea Lab, SJSU’s campus incubator, professors, entrepreneurs and alumni mentors from different industries provide feedback to students. Ray Zinn worked with Jasmine Sanchez and other students through the ZinnStarter program. Photo by David Schmitz. It was time to pitch her idea. In a black blazer and slacks, Jasmine Sanchez took her place next to a large LCD presentation screen, glowing bright blue with the logo for Vessel Athletics, the company she’s trying to launch. Outside the clear glass doors of the Idea Lab, the voices and footsteps of San Jose State students echoed in the corridor of the Diaz Compean Student Union. But Sanchez, ’20 Business, remained focused, having carefully considered every detail of her presentation, including her outfit. “Our focus is on helping students understand what it takes to succeed in life.” says DeLona Zinn (center-right). She had enjoyed seeing the ZinnStarter students, like Andrew Amador (right) and Sanchez (left), present their ideas to her husband, Ray Zinn (center-left) Photo by David Schmitz. 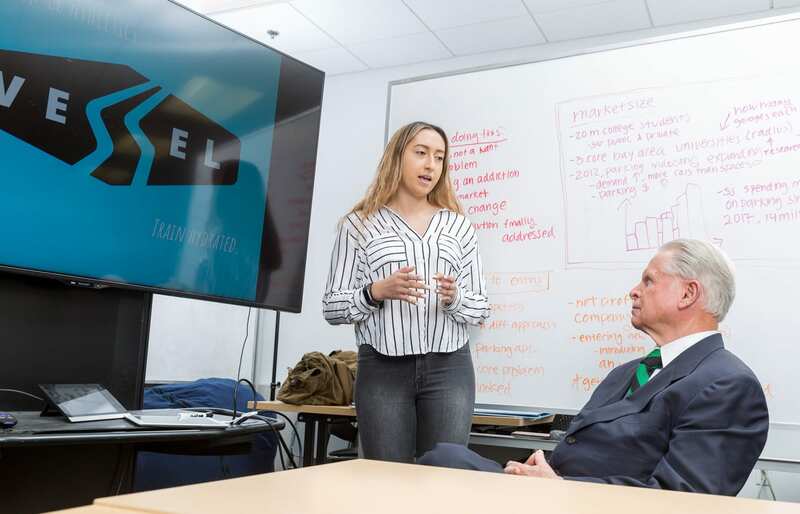 Among the feedback offered during student pitches, Ray Zinn, ’68 MS Business, told Sanchez and the other ZinnStarter Fellows that they have to dress professionally—one level higher than they think they have to—if they want to be taken seriously. And they do. 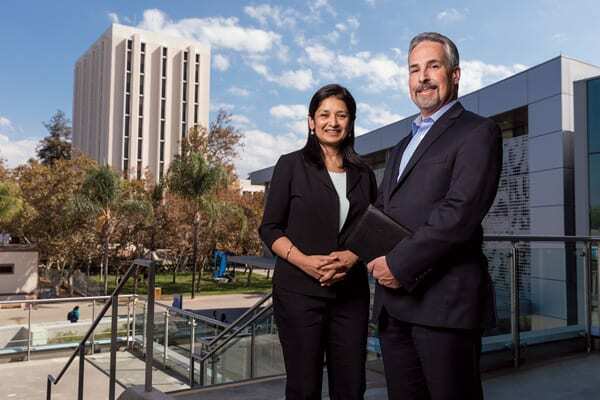 ZinnStarter is now one component of the growing efforts to expand entrepreneurship education at San Jose State, says Anu Basu, professor and director of SJSU’s Silicon Valley Center for Entrepreneurship (SVCE). In SVCE’s competitions, including the Silicon Valley Innovation Challenge (SVIC) and Business Plan Competition, the winners get prizes at the end. With ZinnStarter, the funding comes at the beginning and the selected fellows have to show progress during updated pitches every month over the course of a semester. Zinn insisted that students decide who gets the awards, so a student board was formed, led by the student-run Ideas Club, with Basu as the faculty adviser. Another requirement was that students be connected with mentors, who are entrepreneurs, investors or professors. The best part? SVCE’s programs are open to all students, not just business majors. Inside the Idea Lab is where student startups and the Ideas Club meet and “where a lot of the action goes on,” says Sanchez, who is the club’s outreach coordinator. Without the club or the collaborative space, Sanchez says she doesn’t know how she otherwise would have met her partner, Andrew Amador, ’19 Industrial Design. She didn’t know how to sew or create a physical product, and even asked her family for help. “It was just not working out,” Sanchez says. She told Amador about her idea and what kind of features she wanted to include, and he worked on the physical product. Meanwhile, Sanchez focused on the business side—creating a business plan and going out and talking with customers. The team competed at the SVIC and then applied for and were accepted to the ZinnStarter program. To ground all of this work in business principles, Sanchez is also working on her startup in Anu Basu’s Venture Lab or V-Lab class, where students build a product, get feedback, iterate and gain the confidence they need to launch a business over the course of a semester, and Steve Bennet’s Startup Founders and Funders course. Anu Basu (left) and Dan Moshavi (right) work to help students (below) to develop an entrepreneurial mindset that will benefit them no matter what they do. Photo by David Schmitz. Inside the Idea Lab. Photo by David Schmitz. Soon, the Lucas College and Graduate School of Business plans to launch the Spartan Angel Network, which would allow SJSU to accept philanthropic gifts to invest in student and alumni companies, explains Dan Moshavi, dean of the college. “Our role is helping students who are not part of the traditional Silicon Valley ecosystem understand it and get access to it,” says Moshavi. Silicon Valley is a competitive place, even with all the right connections to the entrepreneurial ecosystem. Nine out of 10 startups fail within the first three years, says Zinn, author of Tough Things First, a book he uses as part of the ZinnStarter program. The goal of ZinnStarter is to cut the failure rate to five out of 10 by instilling in students his philosophy of starting every day by doing your most challenging task first, or “eating the ugly frog,” as Zinn puts it. Discipline, along with integrity and respect, were the values around which Zinn built Micrel, a company known for its low employee turnover. 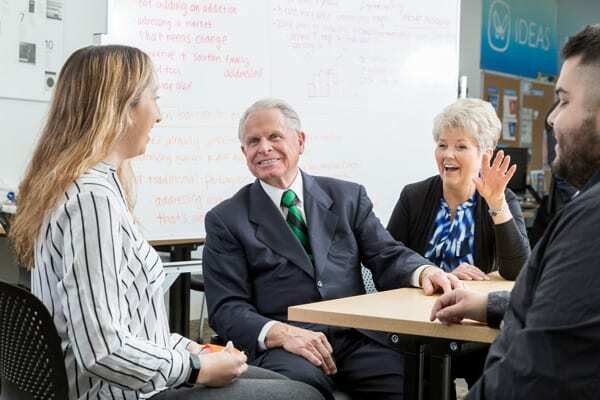 He and his wife, DeLona, who attended San Jose State in the 1950s, put people first and made the company an extension of their family. The point of entrepreneurship, they say, is not to make money. Sanchez and her fellow Ideas Club officers regularly reach out to accelerators, incubators, startups and alumni in Silicon Valley. On the wall in the Idea Lab, you’ll see photos of the club’s group of mentors proudly displayed. Sanchez went from talking about her product to developing the prototype and understanding the financials in her business plan. She is certainly on her way. Calling all alumni and Silicon Valley entrepreneurs! SJSU’s Lucas College and Graduate School of Business was named second among public universities and No. 8 overall in the nation by Money magazine. Be part of this growing entrepreneurial ecosystem. “We are always looking for role models and alumni entrepreneurs who can inspire our students,” says Anu Basu, professor and director of SJSU’s Silicon Valley Center for Entrepreneurship. Serve as a mentor, guest speaker or workshop facilitator. Judge a competition—in person or online. Got a startup? Hire an SJSU intern. Observe and provide feedback at student pitch sessions. Sponsor a hackathon or other event. To learn more about the SJSU Silicon Valley Center for Entrepreneurship and opportunities to get involved, please contact Senior Director of Development Brad Vartan at 408-924-1142.